We’re keeping a close eye on the Rim Fire, as it gets closer to our favorite Sierra stomping grounds. 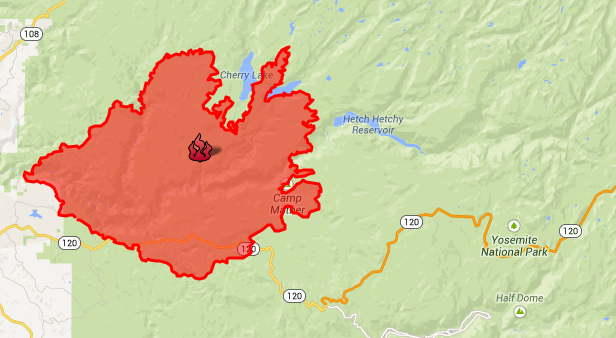 It was over 100,000 acres last Friday morning, already a mega-fire. Now look at it. 160,000 acres and still growing. 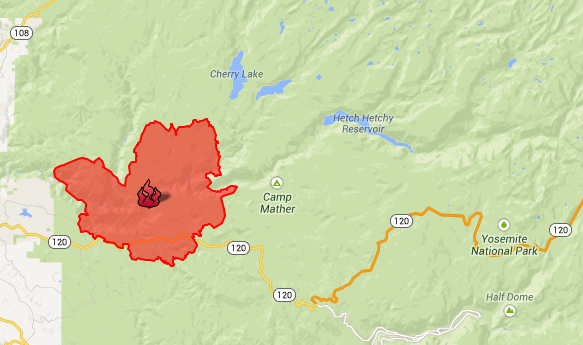 Tonight it’s making a move towards Hetch Hetchy, White Wolf, and the Tioga Road. CalFire is on it, but they’ll need a break or two to get the upper hand. Here’s the Resident Expert, on O’Shaughnessy Dam last summer, examining our water supply in Hetch Hetchy.